Spatial light scattering underpins much of what we do. 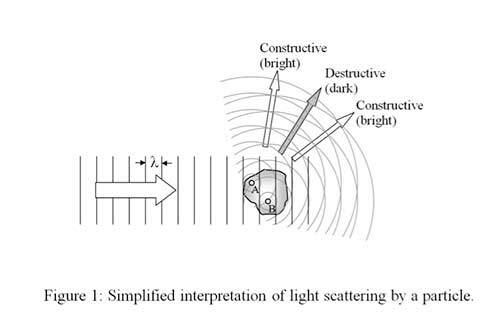 Whenever light travelling through a medium encounters a change in optical properties (for example, meeting a particle suspended in air), some of the incident light energy is redirected from its original path – this is light scattering. The manner in which a single particle scatters light is dependent not only on its size but also on its shape and internal structure (as well as the wavelength and polarisation of the incident illumination and the medium supporting the particle). The potential existed therefore to use the pattern of light scattered by a particle as a ‘thumbprint’ by which the particle could be characterised, classified and even identified. In simplified terms, the interaction of light with a particle may be considered in terms of the electromagnetic wave nature of light and the electrical charges bound within the particle. The oscillating electric field of the light wave (in the plane perpendicular to the wave’s direction) causes the bound electrical charges to oscillate too, and in doing so, they re-radiate secondary electromagnetic waves in all directions (Figure 1). Two arbitrary bound charges at positions A and B within the particle will radiate secondary waves as shown. In certain directions these waves will be in phase and will constructively interfere, producing a higher intensity; in other directions they will be out of phase and will tend to cancel one-another out (destructive interference). The directions of constructive and destructive interference depend on both the relative positions of the charges and how they are bound within the molecules of the particle. Thus, when all bound charges are considered, the unique spatial light-scattering pattern around the particle will depend on the size, shape, and material nature of the particle as well as the wavelength and polarisation state of the incident light (ie: how the electric field oscillations vary in time). It is this unique optical ‘thumbprint’ that is exploited in particle light scattering techniques. 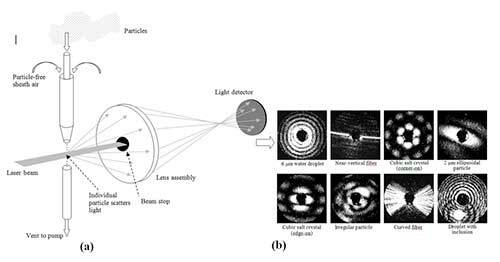 To achieve single particle scattering from particles in air or liquid suspension, it is necessary to control the movement of the particles so that they pass rapidly through the illuminating light beam in single file and produce pulses of scattered light that can be detected and recorded. Often, an arrangement is used in which particles are constrained to flow through a laser beam by ensheathing the particle-laden air column with a layer of clean particle-free air, as in Figure 2 below. If just a single detector is used onto which all of the scattered light falls, the magnitude of the signal from the detector may be used to size the particle. This is the basis of so-called Optical Particle Counter (OPC) instruments that are commonly available commercially. In more sophisticated instruments, the single light scatter detector may be replaced by a detector array to record more detail of the spatial light scattering pattern. Figure 2b shows examples of such high-resolution spatial light scattering patterns recorded using a sensitive camera from individual micrometre-sized particles carried in an airflow. Such spatial light scattering techniques can allow assessment of individual particle shape and structure as well as size and are especially useful in areas where the classification of particles into different categories is required. For example, aircraft-borne instruments allow the classification of cloud ice crystals and water droplets (data important for meteorological climate change research) whilst in clinical fields, instruments can be used to sort various types of liquid-borne cells. Spatial light scattering techniques are also of importance in monitoring applications where the detection of potentially low concentrations of hazardous particles is required in an ambient atmosphere. Examples include the detection of respirable airborne asbestos fibres around demolition sites, or the detection of airborne biological particles in environments susceptible to terrorist attack. In the latter case, measurements of other optical phenomena, such as particle fluorescence, are often employed in parallel with light scattering to improve the confidence of particle classification.